Ed Note: It’s Holiday Spirit Week here at Rock Creek Runner, and we’re celebrating with two awesome giveaways to help you kick-start your training in the new year. You can still enter to win the first awesome giveaway here. Originally I was going to split this giveaway up into separate nutrition and hydration prizes, but then it dawned on me how awesome it would be to win one incredible prize featuring goodies from so many amazing companies. But before we get into that, let’s talk a bit about fueling. Keeping up with nutrition and hydration can make or break a distance runner. Unfortunately scarfing down a dozen donuts isn’t going to cut it, so, it’s important to know how to fuel properly. Finding foods and drinks that are easy on the stomach, easily digestible, and contain the proper amount of calorie – carbohydrate – electrolyte ratio is key. Electrolytes keep the muscles and body moving properly, and calories/carbs give you the sugars and fat that feed your energy levels. Achieving that balance will help ward off major bonks and muscle cramps. In today’s giveaway, I’ve assembled a great package of nutritional products that have that perfect blend to keep you running long. Ultimate Direction Access Hydration Waist pack: Ultimate Direction has been paving the way in innovative hydration packs for long time, and this alternative to the handheld is a perfect example. 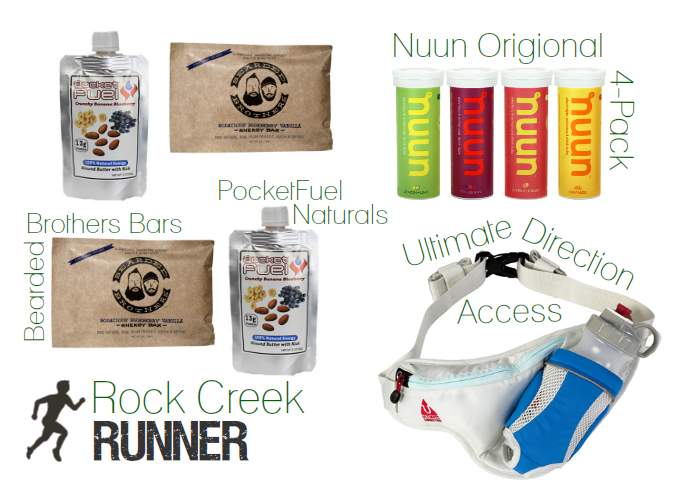 It comes with the signature UD 20oz bottle, and offers plenty of room for gels, chews, or bars. Nuun Original 4-Pack + Holiday Pint Glass (not pictured): Electrolyte hydration drinks are nothing new, but where other companies falter, Nuun does it right. They are packed with just the right formula of electrolytes to keep you energized, alleviate cramps, and keep your muscles functioning properly. Just add a tablet to your bottle of water and off you go. Pocketful Naturals 2-Pack: Tired of gels? I thought so. Loaded with purred whole foods high in potassium, calcium, magnesium, phosphorus and sodium, Pocketful is an all natural, organic, vegan way to get your refuel with just the right blend of minerals and calories during your next long run. We’re giving away two for the winner to test out. Bearded Brothers Bars 2-Pack: I had the privilege of visiting the Bearded Brothers warehouse in Austin recently, and after testing out several of the bars myself, I just had to pick up a few more to add to this giveaway. The 100% natural, vegan, raw, gluten and soy free bars provide a perfectly clean food to refuel with after a run, or to take along with you on the trail. I’ve set it up so everyone has the opportunity to get as many as 8 entries into the giveaway. You don’t need to complete all of the options to be entered into the giveaway, but as with the Injinji Compression Sock giveaway, the more you complete, the more chances you have of being drawn. If you’re already a subscriber or follower, no worries, sign in and click “done” and you’ll still get the point. This contest will end Sunday, December 8th at 11:59pm ET, giving you plenty of time to enter before the end of Holiday Spirit Week. I’ll update this post with winners on Monday. Huge thanks to Nuun and the other companies for providing some of the products in this giveaway. And the winner is….Maggie! Check your email for details. I’m a new runner and have found your blog very helpful. I have my first half marathon in 2 days and am definitely using running mantras to get me through! I’ve tried the Pocket Fuel before and really liked it. I use Justin’s Nut Butter on longer runs sometimes when I start craving something more than just sugar, but the Pocket Fuel (I tried Chocolate Hazelnut) has such an easy opening and it’s a lot less messy than Justin’s. I would love to try all of these products! Love NUUN and Beaded Brothers bars! Eager to try the other products! Very excited about this giveaway! I use Ultimate Direction’s race vest and love it, and have been a fan of Nuun for a while. I don’t like gels so I keep searching for on-the-go nutrition so I’d love to try these! I need to eat more when I run so this would be AWESOME! I LOVE bearded bros. – sincerely, one bearded bro. I love trying new nutrition! Huge Ultimate Direction fan! I’m always looking for a better way to fuel my ultra addiction. i’m going to need to focus more on nutrition as i’m attempting my first trail ultra this coming year! Awesome stuff – thanks for the giveaway! Would love to try the bars, I am always looking for new fuel to try!! I’m coming up to my year anniversary of running. Several races later (last was the WWHM in November), I am looking to 2014 – so do you have any races you would recommend and why? A great selection of prizes! Fingers crossed. Amazing give away! I’d love to try these nutrition products out. I am always trying to find better ways of staying fueled and hydrated during long runs. A nuun holiday pint glass? Amazing!